Sited on the western shore of Chebeague’s East End, the Gray Path begins at One South Road and extends across a meadow and through woods to a bluff and scenic shoreline. The path and shoreline are open to the public year round. Parking can be found along South Road. Providing rare public access to Chebeague Island’s back shore known as Fisherman's Beach. 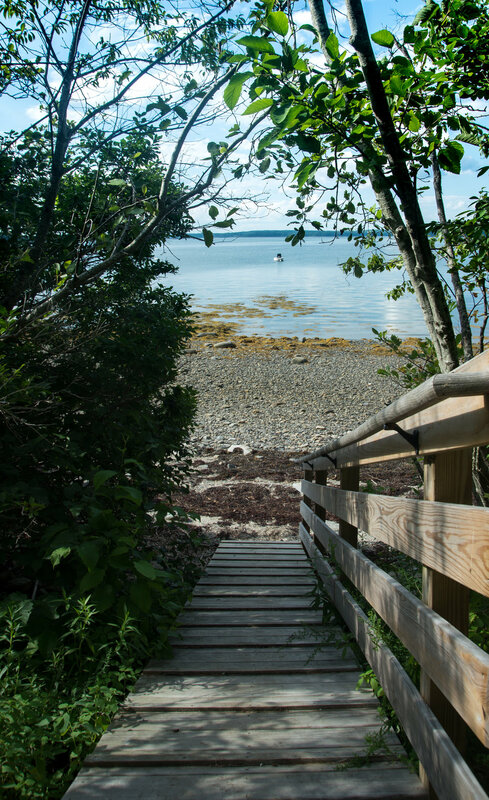 The Gray Path provides valuable access to a beautiful, quiet beach for recreation. Although reasonably small, it spans diverse natural areas including woodlands, vernal pools, a meadow, and 150 feet of shoreline on Casco Bay. From the shore, one is able to enjoy sunsets and scenic vistas including views of Littlejohn Island, Moshier Island, and the entrance to the Royal River in Yarmouth. Known as the Back Shore and also Fisherman’s Beach, this stretch of shoreline was used by fishermen for many years who lived nearby and moored their boats in its sheltered waters. Thanks to the generosity of Mrs. Sheila Jordan and her brother Garland Gray who granted a conservation easement to CCLT, the public will always have access to the back shore on the East End of Chebeague Island. A lovely dedication ceremony for the path was held in May, 2012.